1. Record run: The Dow has closed at a record high for 11 consecutive trading sessions. It’s now creeping closer to the 21,000 point level after blowing past 20,000 points in late January. Another strong performance on Monday would match the index’s 12-day streak of record closes from January of 1987. 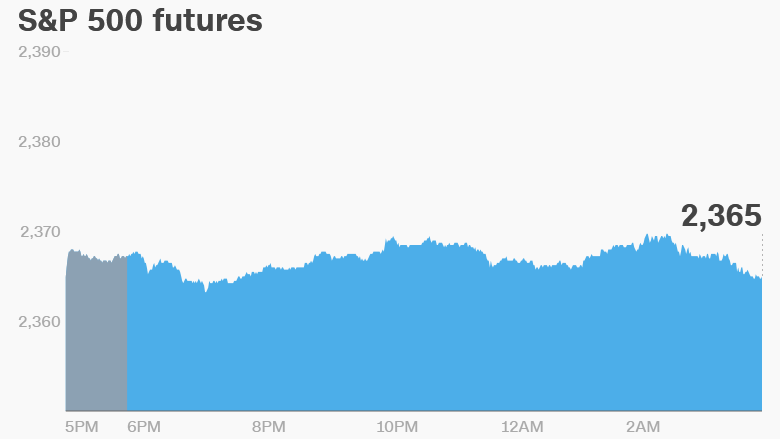 U.S. stock futures were little changed ahead of the open. There was little enthusiasm in international markets: European stocks were mixed in early trading, while Asian markets ended the day with small losses. The British pound was weaker following reports that Scotland could call for a second independence referendum over Brexit. 2. Not a done deal: A mega-merger between two European stock exchanges is in peril. Plans to combine the London Stock Exchange(LNSTY) with Deutsche Boerse(DBOEY), which runs the main German stock market, have been in the works for more than a year. But late Sunday, the London exchange warned that the deal has run into trouble with European regulators. Shares in both companies were down by as much as 5%. 3. Will Trump get his commerce secretary? : The U.S. Senate is scheduled to vote Monday on billionaire Wilbur Ross’ nomination as commerce secretary. 4. Health insurers in focus: Trump will meet with health insurers on Monday, and Obamacare is expected to be at the top of the agenda. Among the attendees will be Humana(HUM) CEO Bruce Broussard. Trump’s first executive order directed federal agencies to start rolling back Obamacare. He has promised to unveil a plan to repeal and replace the health insurance scheme with more affordable coverage, though he has left many in the dark about the details — including congressional Republicans. 5. Earnings:Sotheby’s(BID) and Shutterstock(SSTK) are among the key firms reporting earnings ahead of the opening bell. Hertz Global(HTZ) and Priceline(PCLN, Tech30) are reporting results after the close. 6. Tech talk: The annual tech event Mobile World Congress has launched in Barcelona. Tech firms are expected to reveal new wearable tech devices and highlight developments in augmented and virtual reality. There’s also a spattering of smartphone launches.